Welcome to Day #24 of the 31 Days to Better Branding series! To learn more about this series, click here to find link to the other days so you'll be able to follow along or catch up if you happen to miss anything. There's a good chance that when you think of marketing and making sales, you cringe a little. I think the main reason is because when we picture marketing, we think of used car salesmen, cheap scams, and empty promises. It feels underhanded to ask people to give you their money. But what if you could market in a way that is totally HONEST? What if you could talk to your clients about what you do without feeling like you were always convincing? What if you made your clients feel like they couldn't wait to tell their friends about how awesome you are? This week we're going to get to some of those strategies but today I'm going to focus solely on word-of-mouth marketing. You can't fake this. If you don't have great customer service or a really good quality product, this kind of marketing is not going to help. In fact it will work against you because people will always share their negative experiences. But if what you do is amazing, your clients are going to be excited to work with you again and excited to talk about you to anyone who will listen. Rule #2: Delight your ideal clients. Remember that experience you were trying to create for your ideal client? You want to top off this experience with something surprising, fun or interesting. If you meet all their expectations, that's good but it's also boring. Find one way to delight them. Get creative as it relates to your brand and your target client. For example they might say, "Did you hear about this donut place? When the HOT NOW sign is on, you can go in and get free donuts!" or "Did you hear about this clothing company? If you bring in your bag from a previous purchase, they give away a percentage to charity." Picture your ideal client's gossip circle. What do they love to talk about? What would make them super happy? What would make their life easier or their day slightly better?If you're not sure what this is, ask them. Do that one thing and they will love you (and love to talk about you). Rule #3: Use your words. "No, no, no," you might say. "I'm not good at convincing people and that's way too awkward to tell people why they need my work." More good news. You don't have to give a sales pitch (and please dont!) or give people paid incentives to spread the word for you (please don't do this either!) That feels slimy and sneaky. What you CAN do is talk to them about their experience. Ask questions and listen for ways you can improve. Guard your business' integrity by only promising what you will do and try to surpass your promises. For example if you're a photographer and know it takes you 4 weeks to edit proofs, promise your clients 6-8. That way you can pleasantly surprise them at 4 weeks and guard against being late if something comes up. If they have complaints or questions, answer them. Apologize, be nice and earn their respect. Make them feel like you got their back and then back that up by doing it. Make it really really easy to pass along your business. Include two referral cards in their packaging. Create share buttons on your website. Post on social media in a way that makes them want to pass along what you said or shared. Maybe give them stickers or free samples that scream "tell someone about this." You can also follow up with online tracking to see what was shared the most. Homework: How's your word-of-mouth marketing? 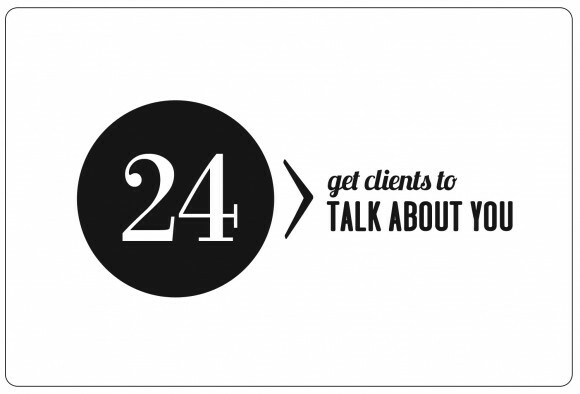 Do your clients love you and have something to talk about? Spend 15 minutes today writing out your game plan.